Buy CISS BROTHER DCP-135C and make 30 times more quality prints for the same money! Pay only 0.04 USD for A-4 full color print! CISS brother dcp-135c is a system of continuous ink supply, which is used in inkjet printers. As we can see from its name, the main task of the system is to provide uninterrupted ink supply to the printing head, according to the ink consumption. In contradistinction to the cartridges, where the ink quantity is limited, in CISS dcp-135c the outer ink containers are provided. They have larger capacity (from 100 to 1000ml). Due to them you could increase the printing volume, use alternative consumables, which you could purchase in packages from 100 to 1000ml. They are cheaper than the original ones. In what lies the difference? Let's start from the printer's productivity, which is defined by the printing speed, as well as by labor intensity of technological operations, of ink refilling and cartridge replacement and also by defect ratio after ink consumption while printing. If you have not yet installed Continuous Ink Supply System cis brother dcp-135c, then you will soon run out of ink and will have to change it. Depending on the printer's model, you will have to make some cleaning operations with a new cartridge. It will take you a lot of time. 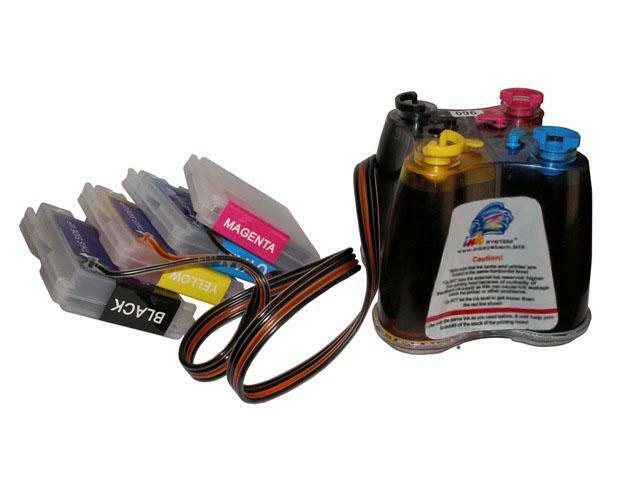 It should be noted, that there are several cartridges with ink of different color, which are installed in the printer (it could be also one cartridge with several different reservoirs). Usually, ink of different color is consumed in different time. That is why, if you have several color cartridges, you will need to replace them time and again. And if you have one color cartridge, you will have to throw it with unused ink. So, the average printing cost and printing time of one sheet is much more higher. Of course, you don't need such problems and you could avoid them by purchasing Continuous Ink Supply System ciss ink system brother dcp-135c or ciss for brother dcp-330c and ciss for brother dcp-350c, which has the similar characteristics. The usage of such system will affect the performance of your device, due to CISS it will increase up to 15-20%. The appliance of Continuous Ink Supply System for dcp-135c provides you with increased productivity and reduced operating and prime costs. Due to it the general operation quality will increase by several times. During an ordinary usage the printer counts the number of printed pages and technical cleanings, which are needed for normal operation of printing device. The printer performs technical cleanings by itself according to the stored program. There are some technical cleanings, which should be done by user. After the accumulation of appointed quantity of data, the printer will stop its operation till counter resetting. If discharge output is leading out to a separate reservoir and you have required skills, you will be able to reset the counter manually and to continue the operation of printer with ciss for brother dcp-135c.